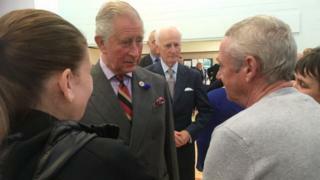 The mayor of Derry has refused to meet Prince Charles, who is visiting flood victims in the north west. Sinn Féin's Maolíosa McHugh said he would not meet the Prince due to his role as Colonel-in-Chief of the Parachute Regiment. Fourteen people were killed on Bloody Sunday when British paratroopers opened fire on a civil rights march through the city in January 1972. Mr McHugh said meeting the Prince would be "premature". Prince Charles arrived in County Londonderry earlier to visit communities affected by August's flooding. Mr McHugh said: "Today's visit to Derry by Prince Charles is difficult for many families in the city, given his ongoing role as Colonel-in-Chief of the Parachute Regiment. "While I have supported meetings between Sinn Féin and members of the British Royal family, I believe that meeting him in Derry is premature given the ongoing and unresolved sensitivities around the legacy of the massacre carried out by that Regiment." The DUP's East Londonderry MP, Gregory Campbell, of "retreating to the comfort of backwoods republicanism". He added: "We hear a great deal from republicans about respect and criticisms of unionism for not reaching out to recognise other cultures and traditions. "It is clear, however, that Maoliosa McHugh does not believe such responsibilities extend to him." Prince Charles began his visit in Eglinton, where he met residents who had been forced out of their homes. He also met farmers and business owners affected by the flooding. The Prince is also due to visit Drumahoe, an area also badly impacted by the flooding and meet with representatives from the emergency services. Almost two-thirds of the region's average monthly rain fell in a single night on 22 August.